Durable materials and impressive craftsmanship hold up to heavy use. Each binder accepts all brands of time-management fillers. 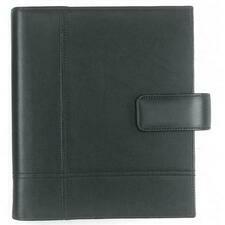 Interior pockets accommodate calculator, business cards, credit cards and self-stick notes. 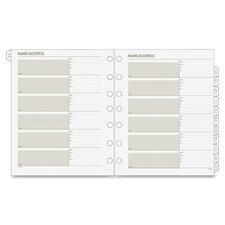 Monthly refill is designed for planner binders. Each sheet is seven-hole punched. Planning pages range 12 months from January to December. Tabbed, two-page-per-month spreads offer ruled daily blocks, Sunday-through-Saturday scheduling, holidays, a ruled section for a to-do list, another ruled section for notes and memos, and past and future months reference. Refill is printed on paper made with a high percentage of recycled content. Weekly planner refill features the beautiful art of nature with subtle floral imagery as a part of the Day Runner Nature Collection. Each quarter has a new design and color. Each two-page-per-week spread includes large, ruled, daily entries for weekdays; a checkbox on every line to mark completed; count of days/days remaining; numbered weeks; holiday Croc bonded Leather Deluxe Starter Sets; and past and current months reference. Saturday and Sunday occupy the same area as one weekday entry. Dated planning pages range 12 months from January to December. 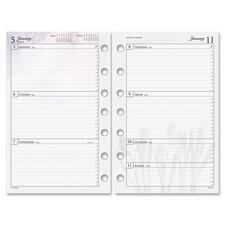 Refill pages are seven-hole punched for easy insertion into seven-ring planner binders. 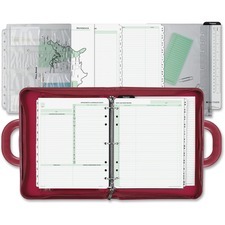 Everything you need to get organized is packaged in this bright, red attache-style binder. Attache style cover offers retractable handles for portability, interior pockets for storage and space for business or credit cards, pen loop and a zip closure for security. 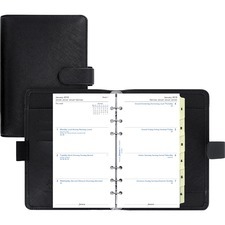 Planner set includes three months of undated pages in three different formats (daily, weekly and monthly), vinyl business/credit card holder, zip storage pouch, undated monthly tabs, address/phone tabs, notepad, and a page locator. Binder has three 1-1/4" rings to hold 8-1/2" x 11" pages. Binder with zipper closure are made of sewn simulated leather with the rich feel of distressed leather but the look of corporate casual and highly effective in performance. 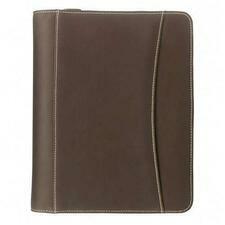 Engineered on the inside with a bank of business/credit card slots, pen loops, and vertical and horizontal pockets. Trimmed off with white top stitching. Franklin Covey Blooms Daily Refills - Daily - 1 Year - January till December - 1 Day Double Page Layout - 4.25" x 6.75"
Planner refill features a fresh-from-the garden design exquisitely illustrating the art of nature with delicate floral imagery. 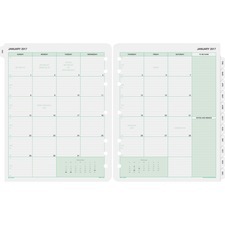 Refill includes two-page-per-day spreads from January to December, monthly calendar tabs for one year and future planning calendars. Printed on recycled paper with 30 percent post-consumer material. Colorful, alphabetical double-letter tabs make it easy to access phone numbers and contacts on these telephone/address A-Z Planner Tabs. Neutral color printing is designed to complement both Express and PRO binders and planning pages. Seven-hole punched design offers a universal fit in small binders. 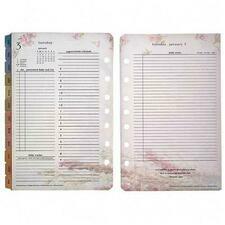 Each tab is labeled with a preprinted letter on both sides except for the tabs with OPQ and XYZ. Preprinted prompts on each page include home/office numbers, fax numbers and e-mails. Loose-leaf pages are printed on paper made with a high percentage of recycled post-consumer fibers. Saffiano Personal Organizer features a classic leather-grain look in beautiful two-tone colors and a simple, understated style. 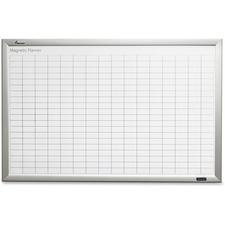 It includes a weekly calendar, six colored index tabs, frosted ruler/page marker, assorted note paper, to-do list and contacts. Pages are bound with six rings and secured with a snap closure. Inside left has a pocket, several card slots, and elastic pen loop. Inside right has one notepad slip pocket.